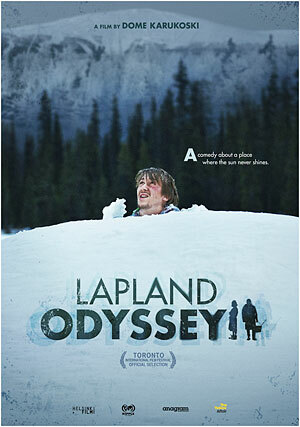 Lapland Odyssey (Director: Dome Karukoski): I’ve always been a fan of Nordic comedies so it was a treat to see this on the last day of this year’s TIFF. I also have a very tiny connection with Lapland. When traveling in Europe by myself in 1989, I had an unlimited railpass, so one day while I was in Helsinki, I decided to cross the Arctic Circle. 18 hours later by train and I was in Kemijärvi. I wandered around for about two hours and then got right back on the train to Helsinki. Mission accomplished. I think that sort of mad determination also drives our hero Janne. Well, perhaps not at first. Ever since his business went bankrupt five years ago, he’s lived on welfare. There aren’t many jobs in Lapland, but at least he has a wife. Most of the women eventually move south, but he’s been with Inari for nine years, although her patience with his lethargy is wearing thin. When she gives him money to buy a “digibox” so they can tune in cable television, he sits around all day and misses the store’s closing time, preferring to hang around with his layabout friends Kapu and Tapio. She gives him an ultimatum. Return by 9:00am the next morning with a digibox or she’ll be gone. He’s also spent the money she gave him on beer, so he and his pals will have to earn some money overnight too. It’s a Friday night, so his first idea is that they’ll use Tapio’s car to run a freelance taxi service outside the local hotel bar. That doesn’t go too well when they run out of gas and decide to siphon some from Inari’s ex-boyfriend. When they finally get to the hotel, the real cabbies take umbrage, but Janne ends up finding a rather unique task where he can earn some money; that is, if he can avoid temptation. Meanwhile, mama’s boy Tapio just may have found the woman of his dreams. I won’t spoil the rest of the plot, but it turns into a sort of quest movie in which the heroes are very dim indeed. As with all Nordic farces, there’s a dark undercurrent of gloom and fatalism. In this case, it’s Janne’s friend Kapu, whose ancestors going back five generations have given in to despair and hanged themselves from a particular tree in the village. In a clever prologue, we see their reasons (one involved hockey! ), and it seems that Kapu might be headed the same way if his circumstances don’t change soon. Because this is a comedy, I don’t think I’ll spoil anything by saying that Kapu doesn’t kill himself. In fact, things turn out rather well for our gang of dimwits. Lapland Odyssey uses both the beauty and strangeness of its far northern setting to great effect. Although we laugh at the very limited opportunities Janne has to earn money, we also sympathize with his lack of inertia. When he does eventually decide to fight to keep the love of his wife, he’s pretty hard to stop. Although none of the characters really changes all that much (a brilliant deus ex machina moment occurs at the end of the film which will leave you grinning), we see the beginning of a desire to change, and that’s enough. Granted, this is not the most original plot, at least in its general outline, but the setting and characters are just specific enough to make this a unique sort of road movie. This entry was posted in Film Festivals, TIFF and tagged #tiff10, arctic, finland, lapland, road-movie. Bookmark the permalink.